You have the Apple T-Shirt, bumper sticker, coffee mug, and your license plate spells "MACDADDY", but nevertheless, something is missing. You still can't shake that nagging urge to prove your fondness for all things Apple. And then it hits you—what you need is a welcome mat! And not just one with a plain old Apple logo, either. 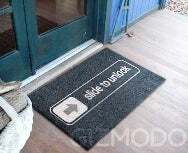 You need a witty Apple doormat, like this one by Meninos, which mimics the iPhone's "slide to unlock" display. Visitors will not only be fully aware of your Apple-lust before they even reach your door, but they'll also know that it's necessary to wipe their feet across the mat before the door is unlocked. Your house will stay cleaner and your love of Apple will be on full display to all passersby. It's even priced like an Apple product, at a not-so-modest $50. If the iPhone's not your thing, Meninos also carries a "command-O" doormat.